Russian President Vladimir Putin set out to undermine the 2016 U.S. election and discredit former U.S. Secretary of State Hillary Clinton in an unprecedented “influence campaign,” eventually deciding to help the chances of President-elect Donald Trump, according to a declassified report by the U.S. intelligence community. “Russia’s goals were to undermine public faith in the U.S. democratic process, denigrate Secretary Clinton, and harm her electability,” according to the report, released late Friday. The release of the report by the top three U.S. intelligence agencies came just hours after intelligence chiefs gave a classified briefing to Trump in New York. Outgoing President Barack Obama, who ordered the report, was briefed on the material Thursday. In the report, both the CIA and the Federal Bureau of Investigation state they have “high confidence” in their conclusions. A third intelligence branch, the National Security Agency, while in agreement, said it has only “moderate” confidence in the findings.Late Friday, Trump posted a tweet that blames the Democrats for being hacked. "Gross negligence by the Democratic National Committee allowed hacking to take place," Trump tweeted. "The Republican National Committee had strong defense." Trump furthered his criticism in a pair of tweets Saturday morning, pointing out that the hacking didn't change any votes and calling democrats "totally embarrassed" by their election loss. Trump called his briefing Friday "constructive," but maintained in a statement that any efforts by Russia or other countries to interfere with the U.S. election had "absolutely no effect on the outcome." Trump also promised to appoint a team to come up a plan to combat cyberattacks on the U.S. by Russia and China, as well as from other countries and entities, within 90 days of his inauguration. "America's safety and security will be my No. 1 priority," Trump said in the statement. "The methods, tools and tactics we use to keep America safe should not be a public discussion that will benefit those who seek to do us harm." Earlier Friday, however, Trump characterized the intelligence community's insistence that Russia interfered in the elections as a "political witch hunt" during an interview with The New York Times, saying it was being carried out by opponents who were still upset about losing to him. His failure to fully endorse the U.S. intelligence community's findings even after the briefing is likely to stir further controversy. White House spokesman Josh Earnest went so far as to question Trump's motives, citing a series of tweets by the president-elect. "His concerns are about something other than protecting classified information," Earnest said Friday. "What those concerns are is something that I'll let him articulate." Some U.S. lawmakers who have also been briefed on the classified version of the report have come away with far different determinations. "Suffice to say, it's stunning in its conclusions," said House Minority Leader Nancy Pelosi. 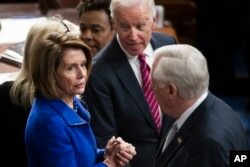 House Minority Leader Nancy Pelosi, center, Vice President Joe Biden, left, and Democratic Congressman Steny Hoyer talk after a joint session of Congress on Capitol Hill in Washington, Jan. 6, 2017. Another Democrat, Representative Bennie Thompson, said the classified report "presents compelling evidence" of Russian interference. The ranking member of the House Homeland Security Committee also said it was "stunning and quite shameful that the president-elect has instead put his energy towards impugning the intelligence community he will soon be overseeing." "This is a troubling chapter in an ongoing story," Richard Burr, chairman of the Senate Intelligence Committee, said in a statement Friday. "The Intelligence Community's report on Russian activities and intentions in recent U.S. elections highlights for the American people the direct and aggressive covert influence campaign conducted against our nation," said Burr, a Republican. "I expect that out our nation's leaders will counter these activities appropriately." President-elect Donald Trump (left), former Senator Hillary Clinton and Russian President Vladimir Putin. Still, some former intelligence officers and Trump supporters maintain there is ample reason to remain skeptical of the intelligence report's findings. Most notably, they argue U.S. intelligence officials have yet to release any information that shows a clear link between the hacks of the Democratic National Committee and other political figures, and Russian operatives. "There's no smoking gun," said Tony Shaffer, a retired intelligence officer who worked with Trump's national security adviser, retired Lieutenant General Michael Flynn. "Every other president who had to make a strong stand regarding an adversary has been willing to provide detailed information regarding how and why it happened," Shaffer said, citing as one example former President John F. Kennedy's disclosure of spy photos of Russian missile sites during the 1962 Cuban missile crisis as an example. Intelligence officials admit that level of detail, which would risk exposing sources and methods, was not included in the declassified report on Russian interference in the U.S. election. And, critically, the report concludes that at no time was Russia able to compromise systems used to tally election results. Instead, the report lays out how the Russian campaign evolved from one seeking simply to undermine faith in U.S. democratic processes — conducting cyber operations against both major U.S. political parties and lobbyists — to one intent on seeing Trump in the White House. FILE - U.S. Secretary of State Hilary Clinton, left, and Russian Prime Minister Vladimir Putin meet at the presidential residence Novo-Ogaryovo outside Moscow, March 19, 2010. "Putin most likely wanted to discredit Secretary Clinton because he has publicly blamed her since 2011 for inciting mass protests against his regime in late 2011 and early 2012, and because he holds a grudge for comments he almost certainly saw as disparaging him," the report said. "When it appeared to Moscow that Secretary Clinton was likely to win the election, the Russian influence campaign began to focus more on undermining her future presidency." The declassified report also maintains that while unprecedented, Moscow's willingness to share, or disclose, hacked intelligence reflects a pattern of activity seen in Russian information operations against Olympic athletes and other governments. Specifically, U.S. intelligence contends Russia's GRU intelligence agency used several conduits to disseminate hacked emails and other documents. These included DCLeaks.com and WikiLeaks, as well as Guccifer 2.0, who claims to be an independent Romanian hacker. but who intelligence officials suspect is really a persona created by Russian intelligence. In one case, content stolen from email accounts targeted by GRU hackers in March 2016 appeared on DCLeaks.com starting in June 2016. U.S. intelligence officials also pointed to Russia's use of its propaganda outlet, RT, which according to the report "has actively collaborated with WikiLeaks" dating to a 2013 meeting between WikiLeaks founder Julian Assange and RT's editor in chief. Russia then amplified these efforts by using professional internet trolls to give more attention to the scandals set off by the WikiLeaks disclosures about the Clinton campaign, according the report, with some trolls beginning to actively advocate for now Trump as early as December 2015. The report said Russian support for the Trump candidacy became bolder as time went on, with Putin supporters and proxies increasingly voicing their support for Trump. The effort culminated with Russian media hailing Trump's victory as "a vindication of Putin's advocacy of global populist movements." FILE - A women enters the four-story building known as the "troll factory" in St. Petersburg, Russia, April 19, 2015. 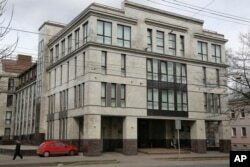 The “troll factory” is where hundreds of young Russians work around the clock writing blogs and posting comments on the Internet staunchly supporting President Vladimir Putin and attacking the West. Alexandra Vacraux, executive director at the Davis Center for Russian and Eurasian Studies at Harvard University, told VOA she was in Moscow in December, where she said she met with "quite a few Russians" who were happy Trump won the election and optimistic about his coming presidency. "They were convinced Hillary Clinton had regime change in Russia as one of her main objectives," Vacraux said. Now, U.S. intelligence officials fear Russia's efforts to influence the 2016 election will be the "new normal," with Russian intelligence agencies gearing up to use similar techniques to target future elections in the U.S. and other Western countries. "The Russians have a long history of interfering in elections, theirs and other people's," National Intelligence Director James Clapper told the Senate Armed Services Committee. "But we have never encountered such a direct campaign to interfere with the election process as we have seen in this case." Trump announced a replacement for Clapper Saturday morning, tapping former Senator Dan Coats to head up the intelligence community. Coats is a former ambassador to Germany who served two years in the army before he represented the state of Indiana in the U.S. Senate from 1989 until 1999 and again since 2011. Coats declined to run for another term in last November's election. “If confirmed as Director of National Intelligence, he will provide unwavering leadership that the entire intelligence community can respect, and will spearhead my administration’s ceaseless vigilance against those who seek to do us harm,” Trump said in a statement.